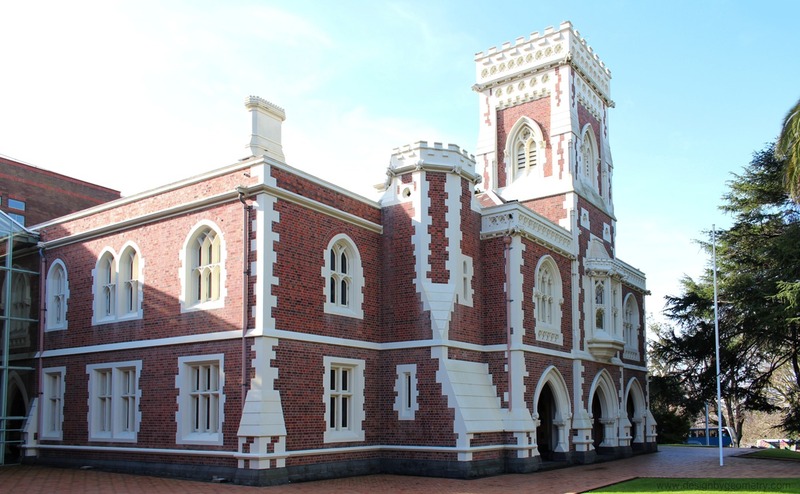 Constructed between 1865 and 1868 in the Gothic Revival style, much of Auckland’s former Supreme Court (now Old High Court) building was restored in the late 1980’s as part of the High Court redevelopment. 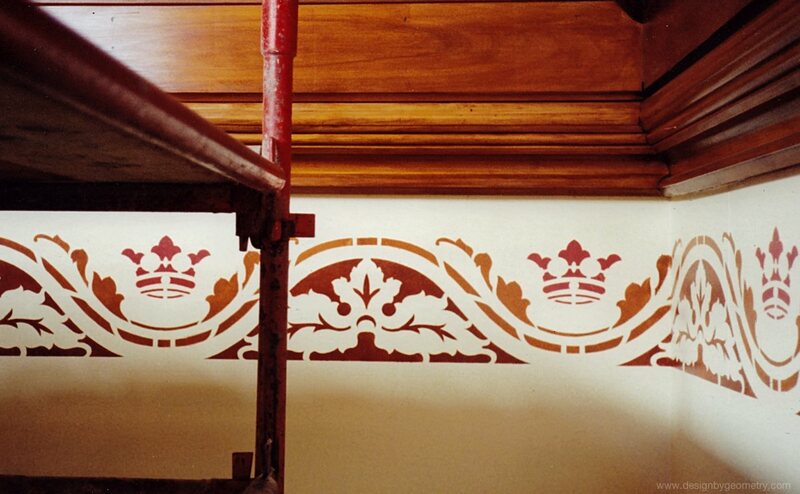 Stencilling features prominently in the restoration of the building’s public spaces. The Former Supreme Court – Now Old High Court Building (2016). 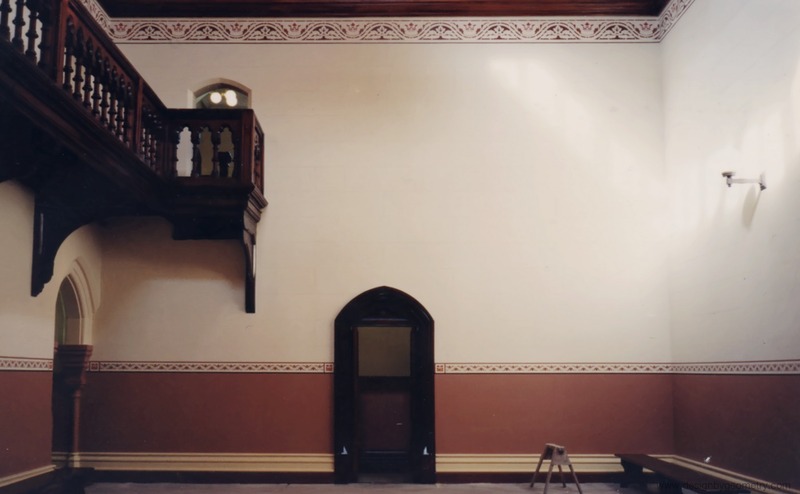 In the late 1980’s, decorative artists Juliet Bamford and Chris Heath worked together to reinstate the former Supreme Court’s decorative stencil patterns in conjunction with Architect Dave Pearson. Unfortunately, the stencil patterns have since been replaced, albeit to a lower standard. I’ll explain later why I consider the most recent application of stencilling to be of a lesser quality. For now, I’ll focus on our efforts to reinstate the stencilling as part of the late-1980’s restoration project, and what informed our variation of the original design. In the main foyer, you can see up to four different stencil patterns. Two patterns can be found in the main foyer (above), one in the entrance (below-right), and another in the corridors that run from the main foyer (below-left). The largest stencil is the frieze that runs around the top of the walls in the main foyer. 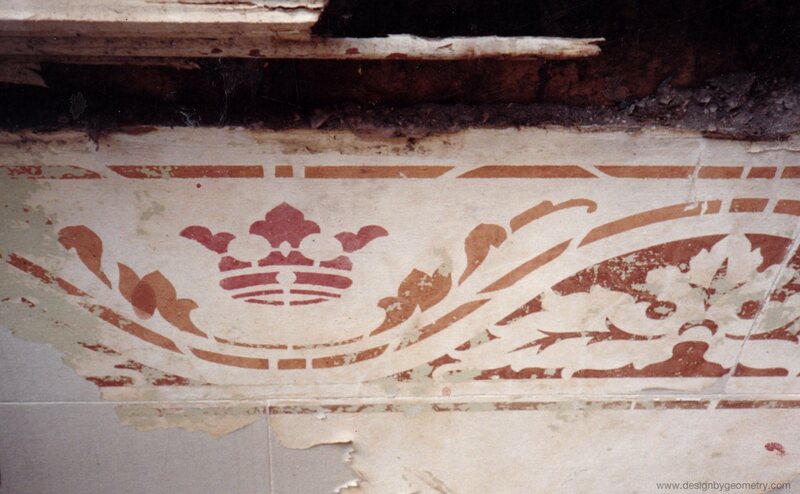 The colours of this stencil echo the colours found in the timber ceiling and adjacent mouldings. The restored frieze (late 1980’s) is a continuous pattern, that is, it has no starting point and no finishing point; it runs forever, so to speak. photos of the original design. Note: This vectorised version is a work in progress and will be tweaked further to bring it even closer to the original. You may have picked up on my mention of “our variation” of the original design. After all, why would we consciously introduce a variation of the original pattern, and not the original pattern itself. The answer is simple; despite best efforts, any reproduction is going to vary from the original. reduce any unintentional changes to the design. To put it bluntly, a carefully considered and researched variation is going to be more faithful to the original than any uninformed variation. Part of the charm of many stencil patterns is the variation that results from copying. However, this imperfect process of copying can, over time, cause a degradation and reinterpretation of the design. The reinterpretation can be far removed from the original. Different peoples’ attempts at copying the original can also result in a lot of variation between copies. The current version (as at July 2016) differs from our late-1980’s version, and both versions differ from the original. 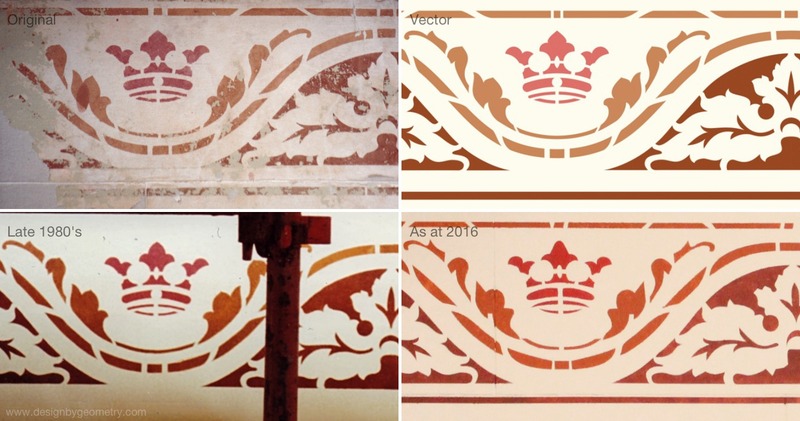 There is always going to be degradation of the original design each time a stencilled pattern is traced for reproduction, and each time a new set of stencils is cut. Care must be taken to ensure any unintended variation from the original is mitigated, and any resulting variation is carefully considered. It’s not just a simple task of tracing the original design, because this can too easily introduce an uninformed reinterpretation of the design’s elements. Even the dimensions of traced drawings can change unintentionally, e.g., Aucklands humidity can play havoc with paper, in particular, tracing paper which can expand and contract significantly with changes in the weather. The partially completed frieze (Late 1980’s). For the late-1980’s restoration, it was considered important to mitigate this degradation of the design. A simple tracing of part of the original design would have resulted in ill-placed curves, poor registration of the repeat unit, and uncomfortably distorted design elements. These are some of the problems that plague the later (current as at 2016) implementation of the stencil patterns. 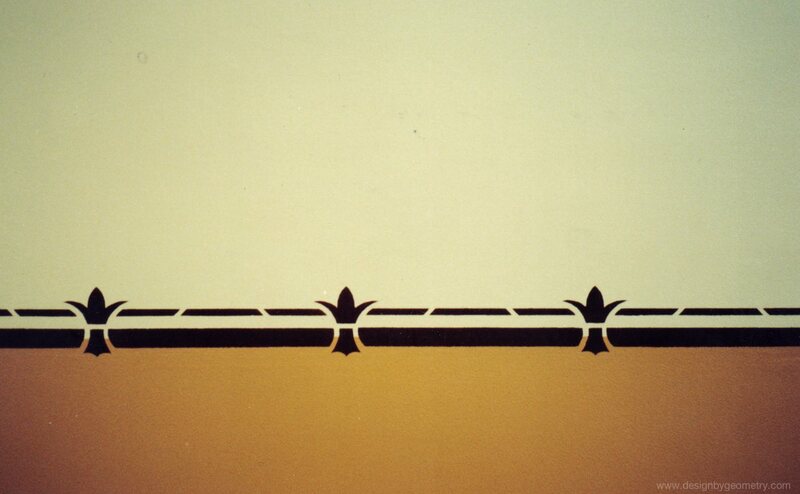 When redrawing the frieze in the 1980’s, the curves of each element were carefully considered to ensure the character of the original design was maintained. Period books on decorative design were referenced to reduce any contemporary stylistic bias, and to gain an understanding of what architects and designers from the 1800’s were trying to achieve when it came to using decorative patterns; a sense of repose. Previous studies into plant morphology also helped to avoid misinterpreting the floral elements of the pattern. Note: Despite best efforts in the 1980’s, part of the leaf pattern was missed and went unnoticed (below-left). It should have appeared as depicted in the modified photo (below-right). All stencil patterns rely on repetition, which means there is always a set of design elements that will be repeated. The first step in analysing the original design was to establish the underlying geometry, in particular, the pattern’s repeat unit. 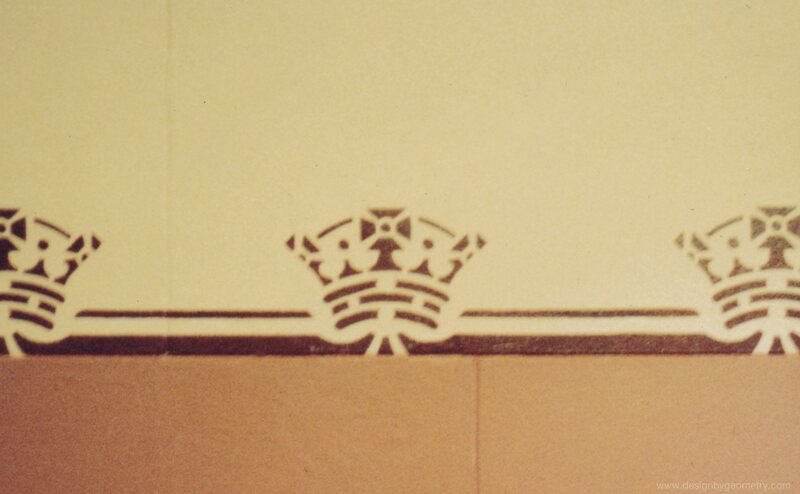 the registration of the stencil using an opaque stencil card (unlike the clear PVC film we used in the late 1980’s). Let me note here that the geometric framework provided a way of grounding the regularity and unique character of the design; it wasn’t slavishly adhered too. Some of the original curves and radii were a little too different to be assumed a result of poor copying. For this reason, they were assumed to be intentional, and therefore not changed. For example, many of the radii that form the crown share a common centre of curvature, except the curve that forms the brim . This curve has a different centre. The geometric grid and it’s regulating lines were used to place and centre many of the design elements: leaves, crown, undulating curves as well as the placement of breaks in the pattern (bridges in the stencil). The repeat unit was marked out on the wall using a pencil, and to our delight, the unit precisely wrapped the finished design around all four walls as a continuous pattern without a break. Note: The current (as at 2016 version) failed to achieve this, and the pattern ends uncomfortably in one of the corners (bottom-right). The stencil cutting technique we used also reduced any variation. The consistency of the paint was adjusted to maintain a uniform stippled finish without bleeding under the stencil’s edges. To further minimise degradation of the pattern, the cleaned up design was glued to cardboard and clear PVC film was placed over it. The PVC film was then cut by tracing the pattern with a knife. PVC was used because it was soft, easy to cut, easy to repair, and strong. Being off a role, it could also be cut to any length as required. In addition to cutting the PVC film (which became the stencil), the knife also scored a groove in the cardboard. This groove became the guide for cutting further stencils as required; thereby reducing any further variation of the design. The clear PVC film also had another benefit — it allowed accurate registration and speedy placement of the stencil on the wall. In the pictures above and below, the clear PVC stencils (now covered in paint around the edges of the pattern) are being stippled with paint using stencil brushes. 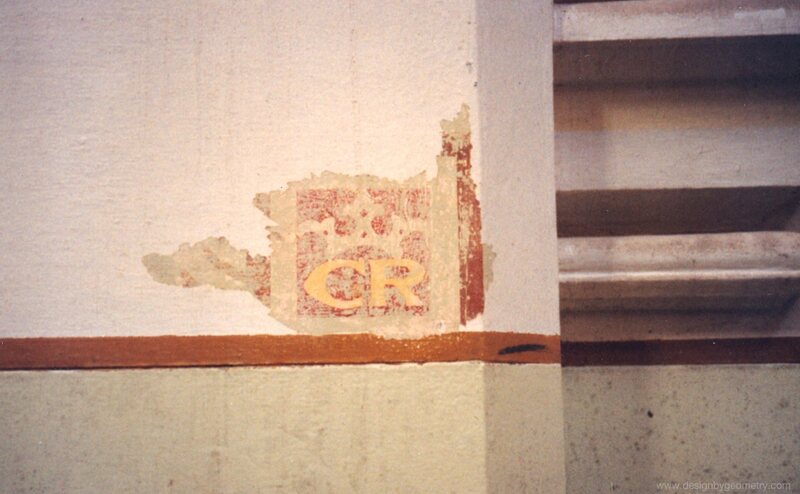 It could be argued that the process of restoring stencils in this way results in a more sterile result. However, if the design was not cleaned up using geometry and modern materials were not used, then the finished product of restoration would have been less than satisfactory. Many unintentional variations would have added to the pattern’s degradation. was poorly drawn/traced. This resulted in severely degraded leaf elements, excessively uneven line thicknesses, and the wobbly uneven curves in the crown and undulating band; many of which are too far removed from the original. From a distance and at a quick glance, the current stencils still look impressive; they just don’t stand up to closer inspection. It’s a shame, that for such an important historical building, more care wasn’t taken with the latest version of the stencil pattterns. The photos below have been through a perspective correction so they can be compared more easily. The newly drawn vector version is included. I see now that there is a little more work to be done to the vector version to bring it closer to the original, e.g., adjustments to the curvature of the undulating band, and the size of some of the breaks. I have already made some changes since preparing the image below. The top of the crown has been rounded off, as has the vesica shape. The circle on the large band is missing altogether. The brim, which should be uniform in thickness is now tapered. The undulating leaves have lost much of their leaf-like characteristics. The thickness of the undulating band varies too much. Some of the large leafshape’s edges are squared off and block-like where they shouldn’t be. The letters G & R are poorly registered. This resulted in white gaps between the yellow and the red colours. Blotchy colours are caused by paint that is too wet. The wet paint is lifted off when another stencil is placed over the top. At eye level, these faults are easier to see. Dado Pattern (2016) showing poor registration and rough edges where the paint bled under the stencil. 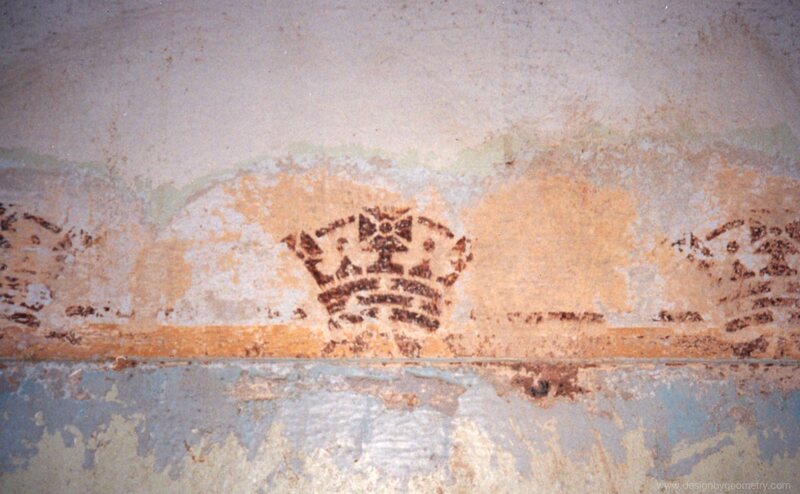 The following picture is of the original dado stencil that was uncovered in the 1980’s. The following photos are of the work that was completed in the late 1980’s by Chris Heath and Juliet Bamford. 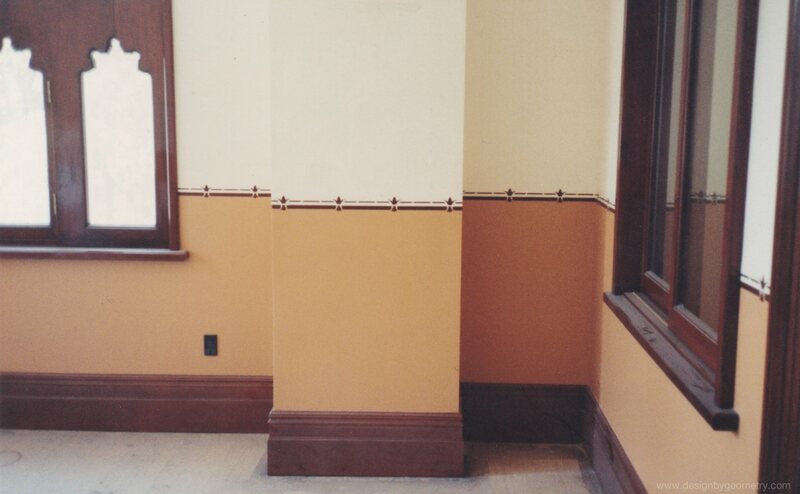 The following pictures are of the dado stencilling soon after application to the offices on the first floor. 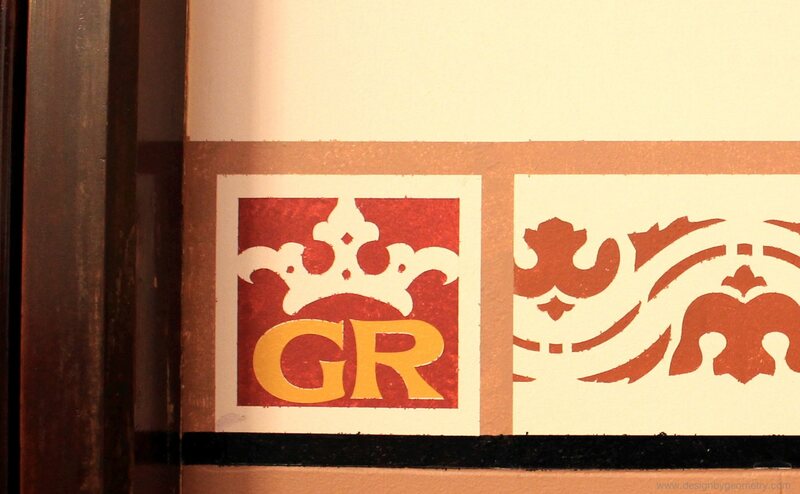 The following pictures are of the crown dado stencil that can be found in the entrance to the main lobby.